Unapologetic style meets tech utility with the Armani Exchange Connected hybrid smartwatch. This hybrid smartwatch is compatible with both Android phones and iPhone. 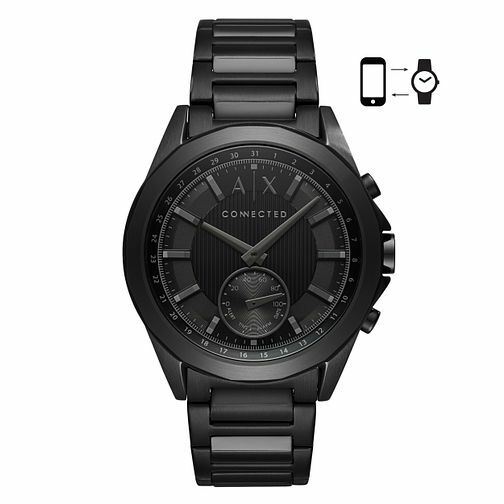 Wirelessly syncing to your smartphone, this watch displays the right time, all the time. This hybrid smartwatch also tracks and monitors sleep and activity, allows you to set up notifications and connects to your smartphone’s music. Its coin cell battery also means the watch never needs charging. The watch's subdial displays the date and tracks your goals throughout the day. Armani Exchange Connected Hybrid Men's Watch is rated 3.0 out of 5 by 2. Rated 1 out of 5 by Anonymous from I loved the product I bought the watch to give it to my business partner as his birthday gift and he really loved it. Rated 5 out of 5 by Anonymous from Very smart looking watch love it Very nice watch absolutely love the design, after couple of months of looking for a new watch this is the 1 i kept coming back to. The only thing i feel could be better is the sleep tracker doesn’t go into detail like others iv seen.